Controlled Denomination of Origin V.Q.P.R.D. Grapes are hand-picked around the third decade of September. Grapes are destemmed and crushed gently; fermentation takes place over a period of 7-8 days in little steel tanks, at controlled temperature. Traditional vinification technique which consists in letting Valpolicella wine – produced in September – go through a refermentation (second fermentation) on the pomaces soaked in alcohol and sugars of Recioto and Amarone wines – produced in January. 12 months in barrel, 4 months in bottle. If stored properly, this wine is likely to age well for up to 5/6 years. We recommend laying bottles horizontally in a dark, fresh place, at constant temperature and humidity. Deep ruby colour. 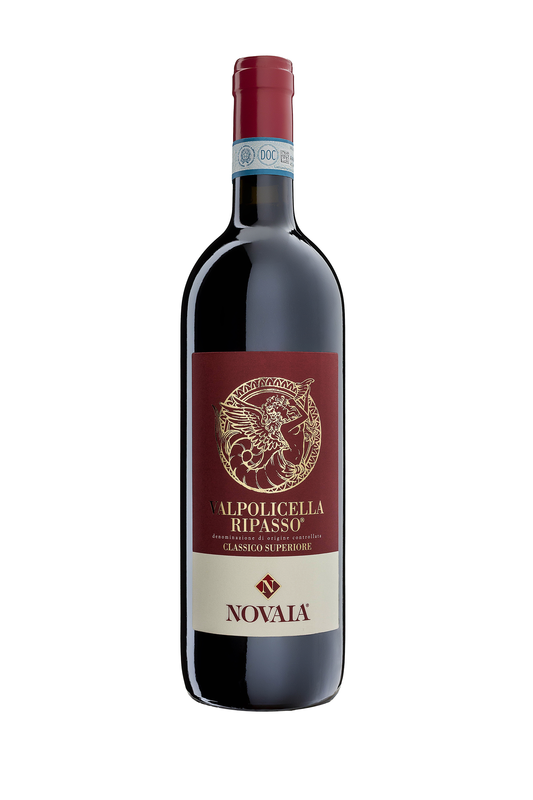 Intense, clean perfume with hints of spices in the nose and a definite note evoking the double fermentation on the Amarone pomaces (ripasso technique). In the palate it has good alcohol, medium-low acidity, developed tannins. Full body and texture, savoury, persistent, nicely harmonious.